Project Management Institute (PMI®)’s Project Management Body of Knowledge (PMBOK®) Guide has seen continuous upgrades since its publication for the first time in 1996. Every four to five years, aspiring PMPs usually get the new edition. It is no surprise that the PMBOK Guide 5th edition published in 2012, has now changed. These updates are in line with project management, which in and of itself is an evolving profession. The current edition of the PMBOK Guide is the 6th edition. It was published in September of 2017 and has been enforced since the end of March this year. That is, if you appeared for the exam after March of 2018, you needed to go by this 6th edition of the PMBOK Guide. There have been professionals who have studied and prepared with the PMBOK Guide 5th edition. Due to personal or professional reasons, they could not sit for the exam before March of 2018, and they may struggle to find the differences with respect to the new edition. Also, there are professionals who hold the PMP credential (in earlier editions), but want to know about the new changes that have come in. This article will address exactly that – the differences between the 5th and 6th editions of the PMBOK Guide. 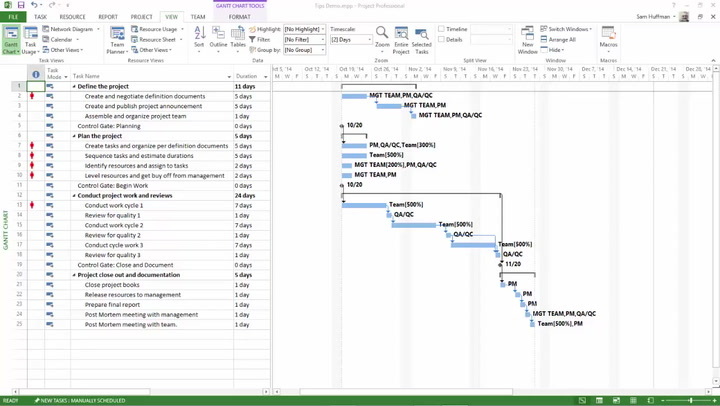 The PMBOK Guide consists primarily of process groups, knowledge areas, and the processes along with the associated inputs, tools, techniques, and outputs (ITTOs). At a high-level, the changes are as follows. There are no changes to the process groups. There are still five Process Groups. There are two changes in the naming of knowledge areas. In total, there are still 10 knowledge areas, which are shown below. The new ones are in bold. “Manage Project Knowledge” in Project Integration Management knowledge area and under Executing process group. “Control Resources” in Project Resource Management and under Monitoring and Controlling process group. One process has been removed. The “Close Procurements” process is removed. It was operating under Project Procurement Management knowledge area and the Closing process group. One process has been moved across knowledge areas. The “Estimate Activity Resources” process operating under Planning process group has been moved from Project Schedule Management knowledge area to Project Resource Management knowledge area. Nine processes, across knowledge areas and process groups, have been renamed. They are noted in the below table. As noted earlier, the process groups are unchanged. You may consider this to be good news. This is important for the exam taker, because your performance evaluation happens with respect to the Process Groups. The number of project management processes (or simply processes) for the process groups are as noted below. Now, let’s look at the key changes for the individual process groups. The salient points for changes in the Initiating process group are noted below. Total number of processes remain as they were earlier (total 2). Business documents are documents outside the boundaries of the project. Hence the project manager does not create or control them. There are two business documents – Business Case and Benefits Management Plan. The focus on “Business Case” is consistent with the PMI Talent Triangle, and so also the focus on Benefits Measurement/Management in a project. Business documents are significant because they act as inputs to some project management processes, including both the processes of initiating process group. The salient points for changes in the Planning process group are noted below. The “Estimate Activity Resources” process has been moved from Schedule Management knowledge area to Resource Management knowledge area. The process of “Plan Human Resource Management” under Resource Management knowledge area is now “Plan Resource Management,” as both team (human) and physical (non-human) resources are considered. The process of “Plan Stakeholder Management” Stakeholder Management knowledge area is now “Plan Stakeholder Engagement,” as you don’t directly manage the stakeholders, rather manage the engagement with the stakeholders. Total number of processes remain as they were earlier (total 24). In the Resource Management knowledge area, as both team and physical resources can be managed, the process “Estimate Activity Resources” is an apt fit in Resource Management knowledge area in place of Schedule Management knowledge area. The salient points for changes in the Executing process group are noted below. The process “Manage Project Knowledge” has been added to Project Integration Management knowledge area. The processes “Implement Risk Responses” has been added to Project Risk Management knowledge area. The “Perform Quality Assurance” process has been renamed as “Manage Quality” in Project Quality Management knowledge area. The “Acquire Project Team” process has been renamed as “Acquire Resources” in Project Resource Management knowledge area. The “Manage Project Team” is now just “Manage Team” in Project Resource Management knowledge area. The term ‘project’ is implicit here. The “Develop Project Team” is now just “Develop Team” in Project Resource Management knowledge area. The term ‘project’ is implicit here. Total number of processes has now increased by 2 (total 10). A significant addition to Integration Management knowledge area is the “Manage Project Knowledge” process. This process also emphasizes the importance of managing knowledge throughout the life cycle of the project. The “Implement Risk Responses” process has been added to Risk Management knowledge area because the risk response plan has to be implemented. Earlier it was happening in the “Control Risks” process, which was really a difficult point while trying to understand the content. The naming of “Perform Quality Assurance” is changed to “Manage Quality” because project management as a profession is more focused on managing quality through a quality management plan. The “Manage Quality” process is also expanded in scope to include product design aspects, process improvement aspects, and the previous aspect of quality assurance. The process “Control Resources” has been added to Project Resource Management knowledge area. The process “Control Communications” has been renamed as “Monitor Communications” in the Project Communications Management knowledge area. The process “Control Risks” has been renamed as “Monitor Risks” in the Project Risk Management knowledge area. The process “Control Stakeholder Engagement” is now “Monitor Stakeholder Engagement” in the Project Stakeholder Management knowledge area. Total number of processes has increased by 1 (total 12). The “Control Resources” process has been added because now physical resources are also considered (in addition to human or team resources). You will be controlling these physical resources. The “Control Communications,” “Control Risks,” and “Control Stakeholder Engagement” processes in the earlier edition are renamed as these are mostly monitored rather than controlled. The salient points for changes in the Closing process group are noted below. “Close Procurements” has been removed from Procurement Management knowledge area. Total number of processes now has been reduced by 1 (total 1). With just one process, it is still called as a Process Group because organizations may have their own additional processes for closing projects or phases, or for contract closure. Procurement closure happens in “Control Procurements” process of Procurement Management knowledge area, but formal completion of contracts happens in “Close Project or Phase” process of Integration Management knowledge area. Confusion can occur with respect to closing. Hence, few important notes on “Close Procurements” have been removed. It was found that globally PMs typically don’t close, rather someone from the contract/procurement or legal team does it. Hence its removal. The closure of contracts can happen many times in the life cycle of a project or in a project having multiple phases. However, the closure of project or phase happens once at the end. Other than administration, information about communication and records also have moved to the “Close Project or Phase” process! I’ve put the summary of these changes for the processes in the process groups in the below. This will help you quickly get the information in one snapshot. As noted earlier, two knowledge area are renamed. Key Concepts: Many of these concepts were there earlier. However, in 6th edition, they have been consolidated. In many cases, they have enhanced and in some cases modified. Trends and Emerging Practices: As the project management profession continues to evolve, so also the associated trends and practices evolve. This section tries to address them. Tailoring Considerations: As every project is unique, the demand or requirements for every project, from project management perspective, is unique. You need not follow all the processes, all the ITTOs, enterprise environmental factors (EEFs), or organizational process assets (OPAs). Rather, you customize what works best for your project. This is tailoring. It has been added for every knowledge area. Consideration for Agile/Adaptive Environments: Agile or Adaptive approaches are now mainstream in many industry verticals. Hence, the PMBOK guide has included what will happen if you working with adaptive approaches. Most of the tools and techniques are now grouped. There are six possible groups. The grouping is done based on the intent (i.e. what the tool or technique is supposed to accomplish). The tools and techniques that cannot be grouped are mentioned individually in the processes. Decision-making: It is used to select a course of action from different alternatives. Examples are Multicriteria Decision analysis and Voting. This also was in the earlier edition. Communication skills: This is used to transfer information between stakeholders. This is somewhat new, but was seen in the PMBOK 5th edition as feedback and/or nonverbal communication. Interpersonal and team skills: This is used to effectively lead and interact with stakeholders and team members. You would have seen most of these in the earlier edition. Examples are Negotiation, Team Building, Active Listening, etc. In addition, there are many tools and techniques which are ungrouped. Many were included in the earlier edition. Known examples are prototypes, risk categorization, and rolling wave planning. New are Agile release planning, Iteration Burndown charts, Prompt list, etc. The PMI-PMP exam is primarily based on the Exam Content Outline, popularly called ECO in short. The ECO lists the exam topics to be covered, the domains PMP aspirants will be tested upon, the tasks under the domains, knowledge, and skills that aspirants need to know. It also indicates what percentage of questions will come from which domain. Domains are knowns as process groups in the PMBOK Guide. In the 6th edition, the ECO has not changed. Hence, the percentage of questions coming from the domains or the process groups remain unchanged. The number of questions from each performance domain shows the proportions. The PMP exam remains pretty close to it, but you can expect a few variations. If you are preparing for the PMP exam, refer the ECO and simultaneously the PMBOK Guide 6th edition, along with other reference books and material covering the latest edition of the PMBOK Guide. If you are a PMP, you will be able to quickly understand the changes as compared to the PMBOK Guide 5th edition by going through this article. More importantly, if you are transitioning from the earlier edition of the PMBOK guide to the new edition, I hope this article will help and guide you in your preparation. This is a very insightful and timely article. It makes PMBOK more relevant and fresh for project management excellence (walk the talk).